A group of Russian Navy experts visited the Republic of Korea from May 30 to June 7, 2010, reviewed the ROK sponsored Joint Investigation Group (JIG) report and collected material necessary for analysis and experiments. The following are the conclusions reached based on the analysis of and experiments on the materials given to the team of Russian experts. 1. The explosion of the Cheonan can be categorized as a non-contact explosion below the ship. – The following was concluded from our examination: Before the sinking, the bottom of the Cheonan ship touched the shallow ocean floor, and all wing blades of its right screw (propeller) and two wing blades of its left screw (propeller) were damaged, and the damaged propellers were scratched so baddly that they became shiny and wide areas of the screws were scratched by friction. The body and the end parts of the aforementioned propeller wing blades were additionally stretched. One wing blade of the right propeller has a metallic crack at the edge, which is inconsistent with the ROK JIG’s opinion “The distortion of the right screw of the ship is due to a sudden stop of the right screw axle”. – Remnant fishing nets were found entangled around the right screw axle of the damaged ship. This contradicts the ROK’s claim that there were no fishing zones in the area of the ship’s voyage. indicates that the torpedo had been in the water for more than 6 months. – The area of the ship’s accident is at risk of ocean mines, which is indirectly proven by the fact that the docking locations and voyage paths are restricted to the west seacoast of the Korean peninsula. The Russian experts’ conclusions are the following. 1. 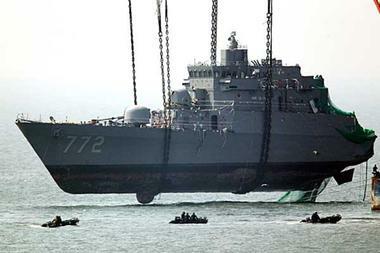 It is confirmed that the cause of the sinking of the Cheonan is due to an explosion outside the ship and in the water. 2. Before the sinking, the Cheonan ship touched the ocean floor on the right, a fishing net was entangled in the right propeller and the right line of the axle, which damaged the propeller wings. Due to the entanglement of the fishing net with the right propeller and axle line, the Cheonan ship must have experienced restrictions in its speed and maneuvers. The Cheonan ship was traveling in a shallow area close to the coast and was entangled with the fishing net, and while it was moving to deeper water, the bottom of the ship might have touched an antenna of an ocean mine, which ignited the explosion of the mine. Another possibility is that the ship was traveling with its malfunctioning navigation system and with a restricted maneuvering capability, it might have been exploded by a ROK’s torpedo. 3. The torpedo part that ROK presented seems to be an electronic torpedo with a radius (sic. “calibre”) of 533mm. However, we do not conclude that this particular torpedo was launched to and impacted on the Cheonan ship. The South Korean government Tuesday denied a report by a local newspaper which said Russia believes an underwater mine, not a North Korean torpedo, sank the warship Cheonan earlier this year in the West Sea. The report, issued earlier in the day by the Hankyoreh newspaper, said that a team of Russian naval investigators had concluded that an external explosion consistent with that of a mine was responsible for the sinking on March 26. A Seoul official said on condition of anonymity that the government has not been informed of any updated information regarding the Russian team’s assessment of the Cheonan incident since July 8. At the time, the Russian foreign ministry spokesman told his South Korean counterpart that Moscow was reviewing the probe results found by a Seoul-led multinational investigation team. The official added that to his knowledge, Russia is still reviewing the results and has yet to reach a clear conclusion over the cause of the maritime disaster. The Hankyoreh report was based on a document titled “A Report on the Russian Experts’ Assessment of the Cause of the Sinking of the Warship Cheonan,” which the newspaper said it obtained from a source. According to the newspaper, the Russian experts held a different view about the cause of the sinking than that of the multinational investigation team. In May, experts of the multinational probe team pointed their fingers at a North Korean torpedo as the cause of the maritime tragedy by suggesting that a serial number engraved on a metal fragment of the torpedo provided the proverbial smoking gun. North Korea denied the findings, claiming them to be fabrications. According to the Hankyoreh, the Russian experts, who visited Seoul for a week in early June to assess of the multinational team’s investigation results, raised several questions regarding the findings. The Russian Embassy in Seoul said that it was not in a position to verify the report, adding it has not been informed of the Russian team’s assessment report. Meanwhile, Russia’s state-run media RIA Novosti reported last Saturday that the Russian experts were still unable to give any decisive answers over the cause of the sinking of the warship. Russian Navy Commander Admiral Vladimir Vysotsky was quoted as saying in a radio interview that “We still have questions about the results of the probe.” Whether the answers will come or not “doesn’t depend on us,” he said. Earlier, the U.N. Security Council wrapped up the Cheonan case by releasing a presidential statement condemning the attack. But the statement didn’t specify that North Korea was responsible for the maritime tragedy that killed 46 South Korean sailors. The Ministry of Foreign Affairs and Trade declined to give specific comments on the Hankyoreh report, reminding reporters of the fact that Russia signed the UNSC statement. Pyongyang’s innocence in the incident is spelled out in 13 points, including claims that the aluminium alloy submitted as evidence were not from a North Korean torpedo, which are made of a steel alloy. The report also dismissed reports that one of its miniature submarines infiltrated South Korean waters – “There should be a limit to cooking up a lie,” KCNA stated. “The US and the Lee Myung Bak group of traitors will never be able to escape the sledge-hammer blow of the times and history for their fabrication of the hideous charade unprecedented in the history of the Korean nation,” the report concluded. “I am S.C. Shin, a civil investigator recommended by Korean National Assembly for the [investigation of the] sinking of Cheonan and I’m writing this letter to let you know the truth exactly here in Korea. I have graduated Korea Maritime University in 1982, served 2 years in Navy as a sailing & gunnery officer, worked for Hanjin Shipping on a containership regular line between Far East & West coast of U.S as a navigator for several years and experienced shipbuilding inspect affair for 7 years in Major Shipyards in Korea such as Hyundai, Samsung, Daewoo and Hanjin Heavy Industry. I have built 3 bulk carriers of 136,000 tons and 10 container ships of 2,000~4,000 tons in charge of hull structure, shipping machinery and outfittings, paint and nautical equipments including navigation system. Unbelievable conclusion and posture of the Administration. <Joint Investigation Group Report> states that the cause of Cheon-an vessel’s sinking is attributable to near-distance, non-contact water explosion. According to this report, it claims, “Cheon-an vessel was sunk as a result of being severed by shock waves and bubble effect caused by water explosion from North Korean torpedo. […] However, a series of data in <Joint Investigation Group Report> actually denies the validity of its own conclusion. HANOI (AFP) – Tensions over the sinking of a South Korean warship will overshadow the Asia-Pacific’s largest security forum when it convenes in Vietnam next week, diplomats and observers said. US Secretary of State Hillary Clinton will join her counterparts from 27 countries and blocs including China, Russia and the European Union for the ASEAN Regional Forum (ARF) on Friday. South Korea has said it wants the forum to condemn North Korea for a torpedo attack which broke the corvette in two in March with the loss of 46 lives. Pyongyang vehemently denies the allegations and says it is ready to retaliate. […] Clinton and Defence Secretary Robert Gates will pay their respects to the dead South Korean sailors during a visit to Seoul’s war memorial on Wednesday, two days before the Hanoi meeting. The allies also plan a naval exercise as a show of strength. They are still deciding where to hold the drill, originally planned for the Yellow Sea, following protests from China. Vietnam said North Korean Foreign Minister Pak Ui-Chun was expected to attend the ARF talks, which also include US allies Australia and Japan. Permanent Security Council members China and Russia ensured the UN’s July 9 statement was “very soft and indirect,” contrary to what Washington and Seoul had urged, University of Sydney Korean studies lecturer Leonid Petrov said. China and Russia have not publicly accused the North of sinking the warship, despite an investigation by the United States, South Korea and other countries which found strong evidence of a North Korean torpedo attack. Diplomats and analysts said that while the ARF is likely to comment on the sinking of the Cheonan — possibly by referring to the UN statement or using similar language — it was unlikely to blame Pyongyang. Communist Vietnam, which will chair the meeting, has major business links with South Korea but sees the North as an ideological ally. “Hanoi will try not to antagonise Pyongyang unnecessarily but also should not shy away from some comment,” said Ralph Cossa, president of the Pacific Forum CSIS research institute in Hawaii. …In the wake of the UN’s statement, nuclear-armed North Korea said it was willing in principle to return to multilateral disarmament talks which it abandoned last year. North Korea can be expected to make more efforts at the ARF to “mend bridges” with Washington and perhaps Seoul, while believing it can “continue extorting concessions and aid,” Petrov said. “But it’s not going to lead anywhere unless North Korea undertakes a major reform. Pyongyang doesn’t understand this,” he said. It came to light Friday that the South Korean government summoned the Russian Ambassador to South Korea and expressed strenuous objections over the Russian government’s failure to provide notification of the findings of its independent team that investigated the Cheonan sinking. The team was dispatched to South Korea around one month ago and concluded that it was unable to view the “No. 1 torpedo” as being the cause of the sinking. According to military and foreign affairs sources connected to Russia, the Russian government provided notification of its independent investigation results only to the Chinese and U.S. governments last week, and South Korea only found out about the content indirectly through those two countries. Following this, 1st Vice Minister of Foreign Affairs and Trade Shin Kak-soo summoned Russian Ambassador to South Korea Konstantin Vnukov to the Foreign Ministry on July 4 to express “astonishment” at Russia’s investigation findings because the findings were a complete contradiction to the South Korean government’s announcement. They also expressed severe dismay about the fact that Russian notified only the U.S. and China about the findings, while leaving South Korea out of the communication loop. Foreign affairs sources reported that Shin used forceful and diplomatically irregular language to denounce Russia’s behavior, calling it “unfriendly conduct that violates trust,” “bewildering,” and “disappointing.” It was also reported to Shin proposed additional discussions with Russia during the meeting, and that the South Korean government subsequently provided additional information to the Russian government. “The Russian investigation team’s primary interest was in whether North Korea, which had been unable to produce its own torpedoes until 1995, suddenly was able to attack the Cheonan with a state-of-the-art bubble jet torpedo,” said a South Korean diplomatic source. Indeed, the technology for bubble jet torpedoes, which are capable of splitting a vessel in two through the expansion and contraction of a bubble resulting from a powerful explosion, is possessed only by the U.S. and a small number of other countries, and has only been successful to date in experiments on stationary ships rather than actual fighting. The joint civilian-military investigation team also acknowledged in its June 29 briefing to media groups that North Korea was the first to have succeeded in using a bubble jet torpedo in the field. Ambassador Konstantin V. Vnukov, 59, is an expert on China. Starting his diplomatic career during the Soviet Union era, he spent five years in China between 1980 and 1985. He returned to China in 1991 as a Russian diplomat, staying there for another five years. Between 1998 and 2003, he was the consul general of Russia in Hong Kong and Macau. Since 2003, the ambassador worked as deputy director general of the first Asian department at the Russian foreign ministry, and was sent to South Korea as an ambassador last October. He speaks English and Chinese fluently. The two Koreas have conflicting interpretations of a U.N. Security Council presidential statement condemning North Korea’s attack on the South Korean naval vessel Cheonan. […] Experts say Pyongyang’s comments convey the North’s desire to close the matter as soon as possible and seek a peace agreement through the six-party talks. The difference of positions between the two Koreas originates from contrasting interpretations of Article 10 of the presidential statement. The article says the Security Council encourages resolution of pending issues surrounding the Korean Peninsula to facilitate early resumption of direct dialogue and negotiations. Seoul interprets this as the resolution of pending issues (the Cheonan incident) should be preceded before dialogue and negotiations, but Pyongyang claims that the pending issues should be dealt with through dialogue and negotiations. New research has suggested that North Korea may not have been responsible for the sinking of a South Korean warship, ‘Cheonan’ on 26 March 2010. According to the Nature News, on 20 May, two months after the sinking of a South Korean warship, the country released a report blaming its northern neighbour. The Joint Investigation Group (JIG), composed of civilian and military experts from Korea and some advisers from the United Kingdom, the United States, Sweden and Australia, concluded that North Korea had torpedoed the ship and was responsible for the deaths of 46 crewmembers. That report soon came under fire from South Korean opposition politicians and an influential South Korean civil liberties group. Now some scientists are lending their weight to the critique. The group’s evidence included “Fragments of a torpedo found near the ship which had the same dimensions as torpedoes pictured in North Korean munitions pamphlets and had ink markings identifying it as North Korean,” the report said. “In the JIG’s report, electron dispersive spectroscopy (EDS) analysis shows the samples to be nearly identical to each other and with those produced in a simulated test explosion: each has similar-sized peaks showing the presence of aluminium, oxygen, carbon and other elements. X-ray diffraction analysis likewise shows the torpedo sample to have the same signature as the ship sample. But on one point, the EDS data and X-ray data are different, the X-ray data lack any sign of aluminium or aluminium oxide,” the journal quoted Seung-Hun Lee, a Korean physicist at the University of Virginia, as saying. Experiments carried out independently by Panseok Yang, a technician specializing in mass spectrometry at the geological sciences department of the University of Manitoba in Winnipeg, found that the ratio of oxygen to aluminium in the rapidly cooling aluminium would be much lower than suggested by the JIG. Lee also said that the JIG did not explain why the blue ink on the torpedo that apparently identified it as North Korean did not melt, as the temperatures following its detonation would have been high enough to melt the paint. 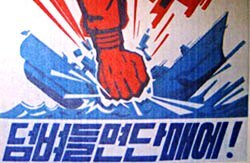 The People’s Solidarity for Participatory Democracy, a Seoul-based organisation that acts as a watchdog on government authority, in its letter to the United Nations Security Council alleged that the report’s claim that a torpedo-induced water column sank the ‘Cheonan’ contradicted earlier testimony from survivors that they did not see a water column or only felt water droplets on the face. It also questioned why the supposed torpedo launch was not detected, despite active sonar equipment aboard the Cheonan, the journal said.